Show Your Customers You Care. Give Them A Document Folder With Your Name, Phone Number, And Logo To Keep Their Important Automobile Papers and Service Records Organized. Keep Your Service Customers Coming Back. We Also Have Document Folders For Motorcycle, Real Estate, Taxes, Legal Documents, And More. E-mail Your Design To autoadsales@aol.com. 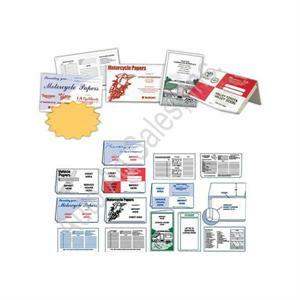 Pictures And Prices Shown Are Standard Folders Available To Be Imprinted With Your Information. E-mail Us With The Item # In The Subject Line And Attach Your Imprint And We Will Be Glad To Send You A Quote/Proof. Available In Manila (B) or White (W), Pink (P), Blue (BL) or Green (G). 12" x 9" File Folders With Black Imprint. Minimum Order 100. Record Envelopes - Keep All Documents Pertaining to Each Vehicle In One Place, Purchase, Reconditioning Cost, Sales Information. An In Expensive Way To Stay Organized. Sold 100 Per Package. Blank Important Paper Holders. Made Of White Crushed Marble Paper, 6" X 9 7/8". 100 Per Package.